My camellias are blooming too! Crazy! I just came in to the house from the back where I've weeded and pruned all afternoon. 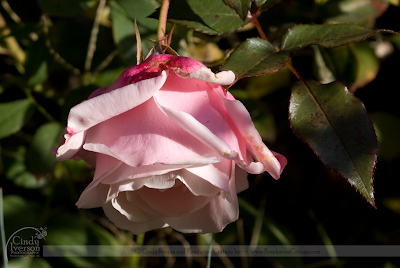 My roses are now officially bare. So I'm enjoying your photos. You are one blessed lady! For the flowers and the pampering hubby! Enjoy and get well. Will chat soon! Oh, crumb! I'm so sorry you were sick for Christmas! My camelias are blooming, too. Love 'em! Take good care of yourself, I was wondering what had happened to you. Get well soon! Beautiful Christmas blooms, hopefully they brightened your spirit! Get well Cindy! Your camelias are beautiful. I have the same luck with them here (Tennessee) by planting them on the north side of my home. It seems most things are early this year. Have a Happy New Year. I always get so jealous of your flower pictures! I would love to grow a Camellia (or a gardenia or a BLUE hydrangea) but our alkaline soils would never permit it even if I could get one to overwinter. Sigh. Earlier today I saw an AWESOME combo for pink roses- pair them with Muhlenbergia 'Regal Mist' also called Pink Mulhy grass. It makes for an amazing combo. Do a google search for 'Cotton Candy and Pink Roses' Muhlenbergia and you'll see a photo of this pairing from the OC Register. Amazing. Lucky for me I can do this pairing in my yard too- just need to do some transplanting as I already have both plants. Oh- and I hope you feel better in short order. Cindy, what beautiful roses. You know that it always reminds me of Granddad. I am so grateful for our blogs and the connectedness that it gives us. There is no way we would share as much via email or snail-mail. I love it. All that said, I am so sorry that your are sick! I hope that you get to feeling better soon. Melanie is an angel. What a wonderful treat for you to receive the Christmas package full of treasures from from her. Her blog is also one I enhjoy. I am sorry Santa brought you a nasty cold for Christmas. You deserved better with all the beauty you have shared with us all year. I a glad hubby is home taking care of you and this cold is short lived and your back is also getting the rest it needs so you can really feel good.. I am so glad you are feeling better! I have been wondering what was going on! So happy you are feeling a bit better cute cousin. 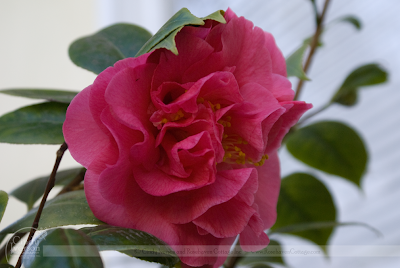 My favorite photo is the last camellia, the very very ruffly one. It kind of reminds me of our orange poppies at home. Adorable. Aww Cindy, so sorry to hear that you've been unwell. I hope it doesn't last long as there is so much in your garden blooming away. Here all I seem to be growing is frost! Well that's a drag getting sick on Christmas. Feel better soon! This is my first season with roses at Christmas, but they're not in nearly as good of condition as yours. Well, now that we've had snow they're not in good condition at all. But apparently we do have blooms at the holidays many years. I hope you get better, soon! Happy Holidays! Cindy, I'm sorry you were not feeling well. I've been home with a viral throat infection and UTI the past 2 days myself. 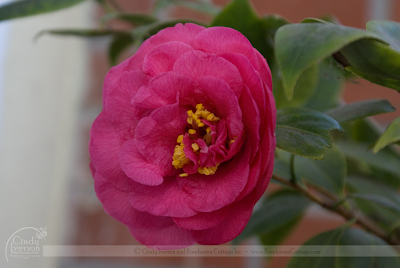 I just went out to feed the birds and I saw my red camellia is starting to bloom too! I love them. how nice to see .Flowers in bloom! Cindy, I hope you are feeling much better by now. I'm so envious of your camellias! Roses, too, at this time of year! 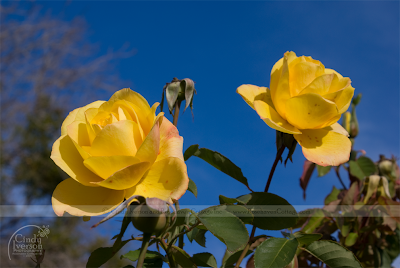 Beautiful photos.... love the blue sky w/yellow roses! Have a wonderful New Year! HAPPY NEW YEAR!! I hope you had a good Christmas despite being ill! Thank you for the messages on my post. The roses are beautiful. We hope to get some yellow roses this year. Hi Cindy! We hope you are doing well and doing everything you can to stay healthy.